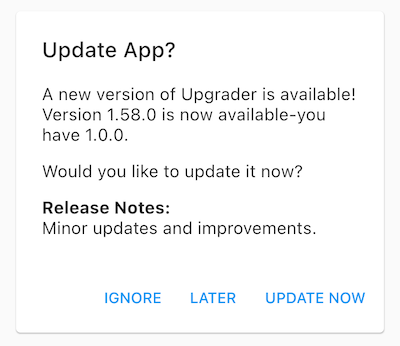 Flutter package for prompting users to upgrade when there is a newer version of the app in the store. When a newer app version is availabe in the app store, a simple alert prompt widget or card is displayed. With today's modern app stores, there is little need to persuade users to upgrade because most of them are already using the auto upgrade feature. However, there may be times when an app needs to be updated more quickly than usual, and nagging a user to upgrade will entice the upgrade sooner. Also, with Flutter supporting more than just Android and iOS app stores in the future, it will become more likely that users on other app stores need to be nagged about upgrading. The UI comes in two flavors: alert or card. The UpgradeAlert class is used to display the popup alert prompt, and the UpgradeCard class is used to display the inline material design card. Just wrap your body widget in the UpgradeAlert widget, and it will handle the rest. Just return an UpgradeCard widget in your build method and a material design card will be displayed when an update is detected. The widget will have width and height of 0.0 when no update is detected. The UpgradeAlert widget can be customized by setting parameters in the constructor of the UpgradeAlert widget. prompt: the call to action message, which defaults to Would you like to update it now? title: the alert dialog title, which defaults to Update App? These widgets work on both Android and iOS. When running on iOS the App Store will provide the latest app version and will display the prompt at the appropriate times. On Android, this widget does nothing as there is no easy way to query the Google Play Store for metadata about an app. Without the metadata, the widget cannot compare the app version with the latest Play Store version. It will not disrupt the widget tree and can be included in an Android without any issues. There is now an appcast that can be used for Android and iOS to remotely configure the latest app version. The class Appcast, in this Flutter package, is used by the Upgrader widgets to download app details from an appcast, based on the Sparkle framework by Andy Matuschak. You can read the Sparkle documentation here: https://sparkle-project.org/documentation/publishing/. An appcast is an RSS feed with one channel that has a collection of items that each describe one app version. 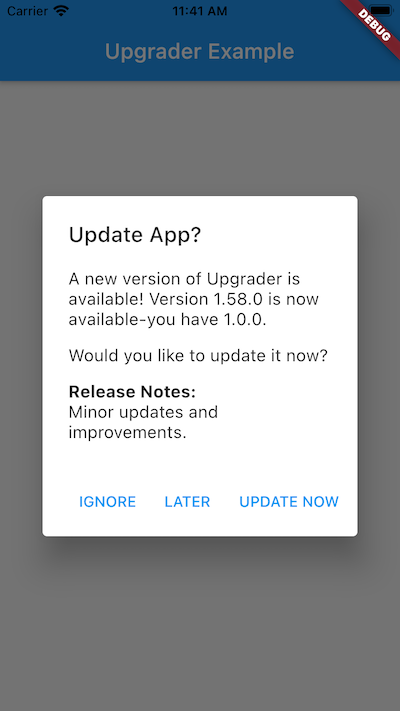 The appcast will decscribe each app version and will provide the latest app version to Upgrader that indicates when an upgrade should be recommended. The appcast must be hosted on a server that can be reached by everyone from the app. The appcast XML file can be autogenerated during the release process, or just manually updated after a release is available on the app store. The Appcast class can be used stand alone or as part of Upgrader. 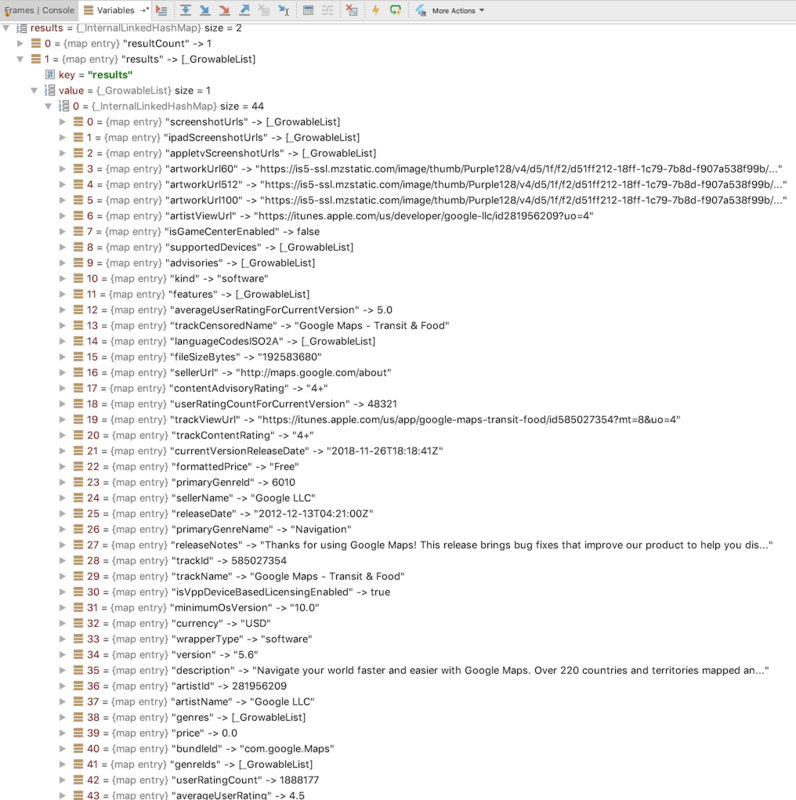 There is a class in this Flutter package used by the upgrader widgets to download app details from the iTunes Search API. The class ITunesSearchAPI can be used standalone to query iTunes for app details. line 173 col 3: The class 'Future' was not exported from 'dart:core' until version 2.1, but this code is required to be able to run on earlier versions. line 160 col 15: The value of the local variable 'count' isn't used. Common filename patterns include main.dart, example.dart, and upgrader.dart. Packages with multiple examples should provide example/README.md.